The new economy has developed rapidly in recent years with the groundbreaking technological innovations. In that development, the effects of the platform economy, sharing economy and gig economy on the gendered dimensions of work are growing. 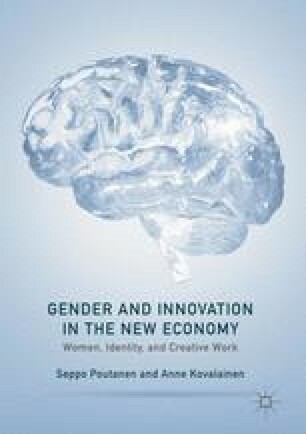 The chapter discusses the multilayered relationships between the old and the new economies, considers global significance of the rising platforms and gig economies and the gendered changes they push forward, and looks where the innovations are currently made in this age of digitalization. The interconnectedness of the world creates new opportunities for the local and regional economies. However, the new economy has gendered structures of its own, which affect availability of the new assets, such as venture capital. This chapter sheds light also on the unintended gender consequences of the new economy. Bernhardt, A. (2014) Labor standards and the reorganization of the work: gaps in data and in research. ILRE Working paper No. 100-14. http://irle.berkeley.edu/workingpapers/100-14.pdf. Retrieved 1.9.2016. Brinkley, I. (2016) In search of the Gig Economy. The Work Foundation, August 2016. www.workfoundation.com. Retrieved 28.9.2016.
Business Insider (2014) Instagram’s Kevin Systrom: People keep Asking if my $1 Billion was too small. (www.businessinsider.com Jul. 19, 2014). Retrieved 1.6.2015. Close, S. (2016) The political economy of creative entrepreneurship on digital platforms: case study of Etsy.com.Paper presentation at the 49th Hawaii International Conference on System Sciences, 2016. https://www.computer.org/csdl/proceedings/hicss/2016/5670/00/5670b901.pdf. Retrieved 11.12.2016.
Cooper, M. (2003) The KodakGirl Collection. www.kodakgirl.com. Retrieved 14.7.2016. Eurofound (2016) Annual Work Programme 2016. European Foundation for the Improvement of Living and Working Conditions. http://www.eurofound.europa.eu/publications/work-programme/2015/annual-work-programme-2016. Retrieved 11.8.2016. Florida, R. (2014) Europe in the creative age, revisited. Demos Quarterly, 1, 2014–2014. Winter. http://quarterly.demos.co.uk/article/issue-1/europe-in-the-creative-age-revisited-7/. Retrieved 11.12.2016. Frey, C. B., & Osborne, M. A. (2013) The Future of Employment: How Susceptible are Jobs to Computerisation? Oxford Martin Programme on Technology and Employment. Oxford Martin School, University of Oxford. http://www.futuretech.ox.ac.uk/sites/futuretech.ox.ac.uk/files/The_Future_of_Employment_OMS_Working_Paper_0.pdf. Howard, A. (2016) Why fixing tech’s gender and racial gaps is more crucial than ever. Techrepublic.com/. http://www.techrepublic.com/article/why-fixing-techs-gender-and-racial-gaps-is-more-crucial-than-ever/. Retrieved 26.7.2016. Kenney, M., & Zysman, J. (2015) Choosing a future in the platform economy: The implications and consequences of digital platforms. Kauffman Foundation New Entrepreneurial Growth Conference, Discussion Paper. Amelia Island Florida – June 18/19, 2015. http://www.brie.berkeley.edu/wp-content/uploads/2015/02/PlatformEconomy2DistributeJune21.pdf Retrieved 21.6.2016. Munir, K. (2012) The demise of Kodak: five reasons. Wall Street Journal, Feb. 26, 2012. Blogs.wsj.com/sources/2012/02/26/the-demise-of-kodak-five-reasons. Retrieved 22.11.2015. NCWGE (2012) National Coalition for Women and Girls in Education. Title IX at 40: Working to Ensure Gender Equity in Education. Washington, DC: NCWGE.NCWIT (2016) Statistics on IT workforce. National Center for Women & Information Technology. https://www.ncwit.org/ncwit-fact-sheet. Retrieved 15.7.2016. OECD (2004) Science and technology statistics portal. Retrieved on 15th June 2015 from https://stats.oecd.org/glossary/detail.asp?ID=6267. Schonfield, E. (2011) The rise of the “creative” class. Techcrunch. com. 14.12.2011.at http://techcrunch.com/2011/12/14/creative-class/. Retrieved 1.5.2016. Seppälä, T., & Mattila, J. (2016) Ubiquitous network of systems. Working paper. Berkeley Roundtable on the international economy (BRIE) and ETLA, The Research Institute of the Finnish Economy. https://www.etla.fi/wp-content/uploads/BRIE_Sepp%C3%A4l%C3%A4_Mattila-2016.pdf. Retrieved 14.12.2016. Statista (2015)The Statistics Portal. Venture capital - Statistics & Facts. https://www.statista.com/topics/2565/venture-capital/ Retrieved 14.3.2016. The Economist (2012) Kodak. www.theeconomist.com. Retrieved 11.5.2016. Womens VC Fund (2016) retrieved 12th January 2016 from www.womensvcfund.com. World Economic Forum and Boston Consulting Group (2016) Health Systems Leapfrogging in Emerging Economies: Ecosystem of Partnerships for Leapfrogging. May 2016. Retrieved 12. 10. 2016 at: https://www.bcgperspectives.com/Images/WEF_Health_Systems_Leapfrogging_Emerging_Economies_report.pdf. Zumbrun, J., & Sussman, A. L. (2015) Proof of a ‘Gig economy’ revolution is hard to find. The Wall Street Journal. 26. 7. 2015. at https://search.proquest.com/docview/1698834883?accountid=14774. Retrieved 8.5.2016.